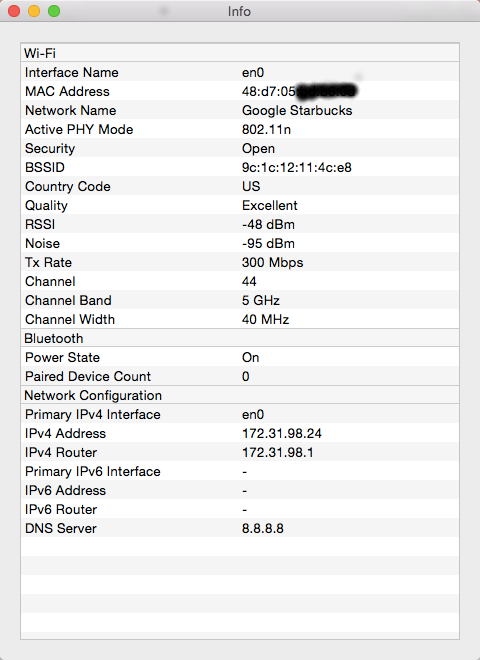 I wanted to know how many wireless access points (WAPs) were using what channels near my place. 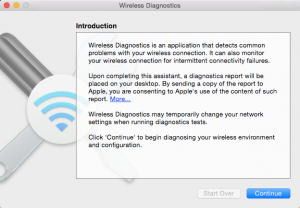 I googled and found a reference to the built-in OSX tool, Wireless Diagnostics. But to be fair, the app is hidden. Now click on Wireless Diagnostics. Now press COMMAND-2. You’l see data pertaining to your current WIFI connection. Of importance to the Quality line. Now press COMMAND-3. 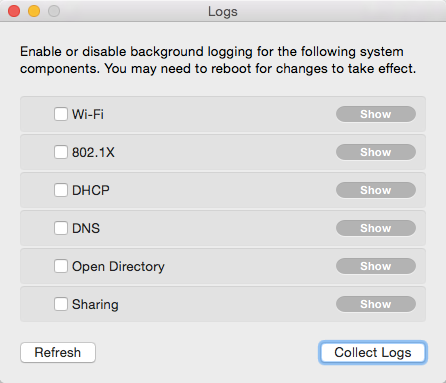 You can log stuff here. I think COMMAND-4 is the most interesting one. 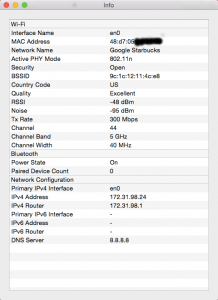 This is the list of SSID which were found during the latest scan. You refresh this list via the Scan Now button. 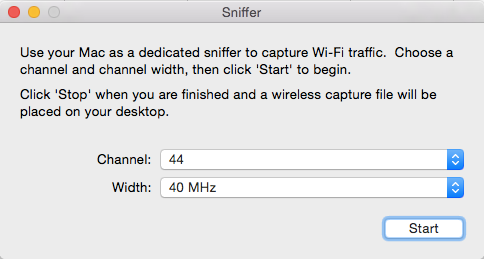 As you can see, the same SSID can occur on more than one frequency and more than one channel. Your laptop will figure out which is better suited and use it. In the summary panel, on the left hand side of this window, you can see the best channels to use. I use this information to adjust my WAPs to avoid conflicting with other WAPs. 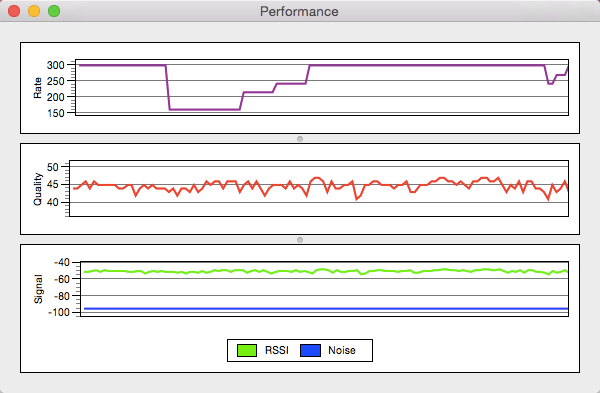 Command-5 gives you the transmission rate, the signal quality, and the signal strength. 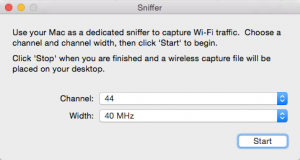 Command-6 lets you capture traffic, or sniff. I hope you find this as useful as I did. 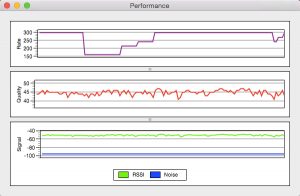 I used to adjust my WAPS to give me a better signal quality. 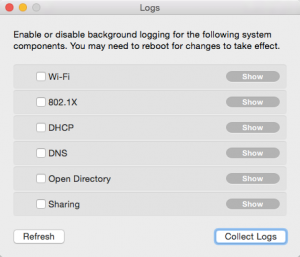 I also plan to adjust all my WAPs to run off the same SSID. At present, there are 6 different SSID in my house. I’m going to reduce that to 2. One will be a guest WIFI; the other will be for my private use. I’m still toying with the idea of putting my WAP in a DMZ (actually, their own VLAN), from which you can reach the internet, but no where else. I’ll then use a VPN to get into my home LAN.